UPDATE (29 December): Lina’s hearing on 22 December was postponed to 29 December. She is expected to be brought before Ofer military court today. UPDATE (18 December): Lina Khattab was charged with “throwing stones” and “participating in an unauthorized demonstration” on 18 December by military prosecutors at Ofer Military Court, reported Mahmoud Hassan, director of Addameer’s Legal Unit. Her next hearing will be on Monday, 22 December, in the military court. Click here to take action and demand Lina’s freedom! 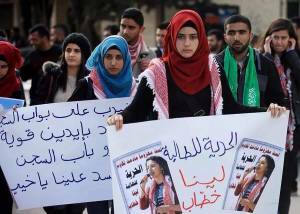 Lina Khattab, 18-year-old first-year media student at Bir Zeit University and dancer in the El-Funoun Palestinian cultural dance troupe, was arrested on 13 December during a march by Bir Zeit University students to Ofer military prison. Click here to take action now and demand freedom for Lina Khattab! She is active in Palestinian national and political activities at the university, and is one of a number of active Palestinian students who have been arrested and imprisoned in an Israeli attempt to clamp down on Palestinian students’ activity and organizing through student unions and protest groups. Lina is being held without charges, and allegedly “investigated” on the bogus suspicion of “throwing stones,” an allegation used freely by Israeli military courts against all Palestinians who demand their rights through protest. Her detention was extended until Thursday, 18 December at Ofer Military Court on suspicion of “throwing stones,” said Mahmoud Hassan, lawyer with Addameer Prisoner Support and Human Rights Association, reporting on the court hearing on Tuesday, 16 December. Lina was held outside in the cold for hours at Ofer prison before being taken to interrogation, and then transferred to HaSharon prison late at night. G4S, a British-Danish security company – the largest in the world – and the target of a massive international boycott campaign for its involvement in human rights violations, provides the security system at HaSharon prison. Students at Bir Zeit University protested and marched demanding Lina’s freedom, and the freedom of all Palestinian students held as political prisoners in Israeli occupation prisons, at a demonstration organized by the Progressive Democratic Student Pole on Monday, 15 December. 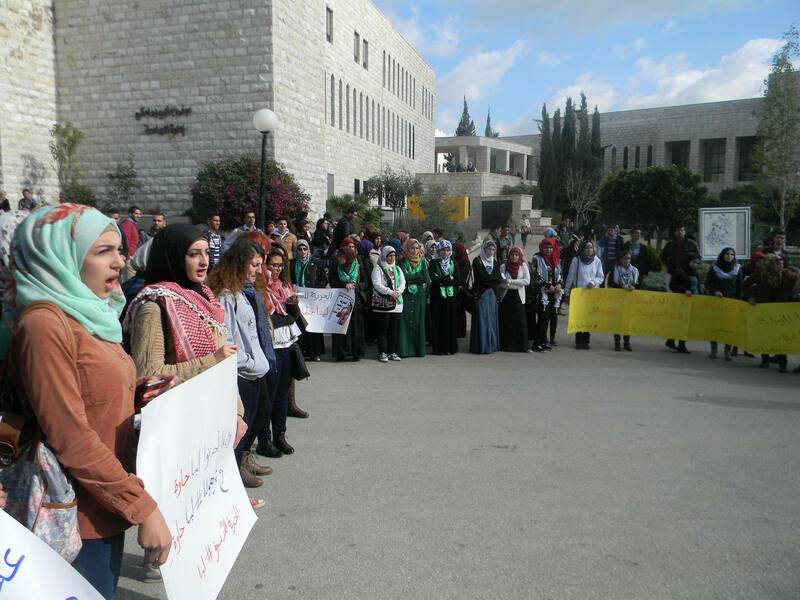 The protest also addressed the case of Islam Badr, another Bir Zeit student, currently engaged in the hunger strike of Palestinian political prisoners protesting solitary confinement. He was previously on hunger strike for 45 days against the practice of administrative detention without charge or trial. 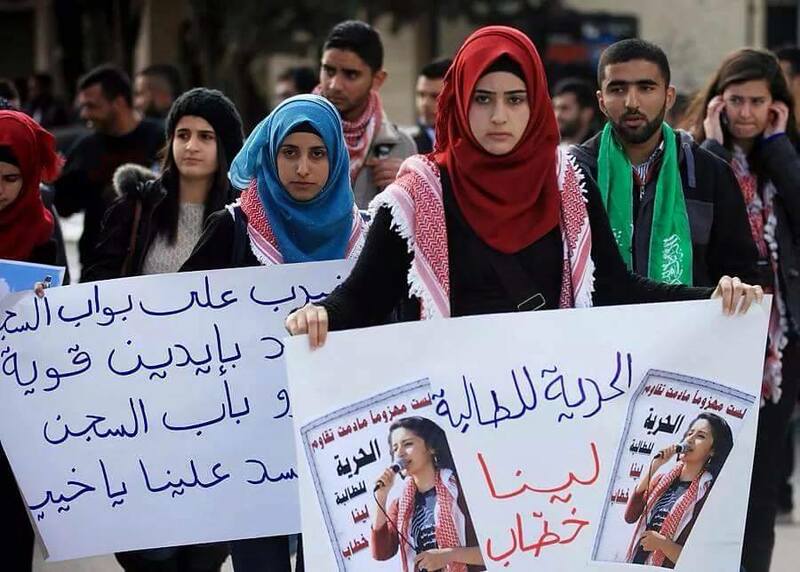 Samidoun Palestinian Prisoner Solidarity Network demands the immediate release of Lina Khattab and denounces the clear-cut Israeli policy of targeting Palestinian students who actively defend the rights of the Palestinian people. 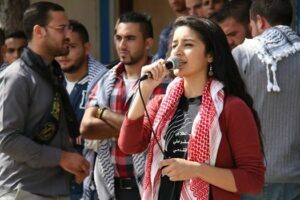 Student organizing has been at the heart of the Palestinian movement for decades, and such arrests are a transparent attempt to undermine and destroy the student organizations at Palestinian universities that uphold those universities as spaces for national Palestinian education and activity for liberation and freedom. Take action – demand the release of Lina Khattab! 1. Take action to demand the immediate release of Lina Khattab. Sign the letter here and send it to Israeli officials, including Prime Minister Netanyahu. 2. Take action for Palestinian prisoners: protest at an Israeli consulate or embassy, or hold an educational event Palestinian prisoners. 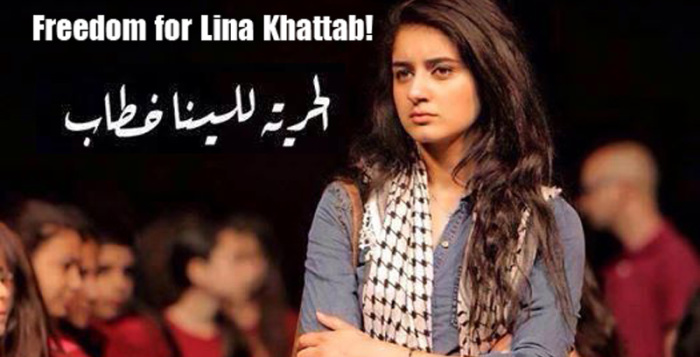 Demand the freedom of Lina Khattab and Palestinian political prisoners. 3. Join the movement for boycott, divestment and sanctions. Isolate Israel for its mass political imprisonment of Palestinians. Boycott products like HP and SodaStream, and demand an end to security contracts with G4S, which provides the security system at HaSharon that imprisons Lina and other Palestinian women. Learn more at bdsmovement.net. Posted on January 18, 2015, in Middle East and tagged Palestine, Prisoners' Struggle. Bookmark the permalink. Leave a comment.